Last week, a Dáil motion on cost rental housing was successfully passed. Proposed by Green Party TDs Eamon Ryan and Catherine Martin, it gained coverage primarily because of the locations suggested by the Green Party for pilots: Cathal Brugha Barracks and the Broadstone Depot. Both of those sites are near the epicentre of the housing crisis. Over the last three decades, there has been a return to urban centres across the world, including in Ireland. This likely has a number of contributory factors, one of which is the banning of smoky fuels, which made urban centres visibly dirty. This move back to city centres was hidden from view somewhat in Ireland during the Celtic Tiger, as policymakers and private sector were more comfortable with extending the cities, through motorways and greenfield developments, than recycling the cities. But reusing the same site for a new purpose – what is known in the business as brownfield development – is central to what keeps a city thriving. And this is where Cathal Brugha Barracks and the Broadstone Depot come in. Cathal Brugha Barracks – or Portobello South, as it would no doubt become – is a sprawling 17-hectare site. It is situated between Dublin 6 and Dublin 8, both areas in very high demand in recent years. In Dublin 6, rents have risen 82% from their lowest point, while in Dublin 8, they have almost doubled in a few short years. The picture is not much better near Broadstone Depot, or Stoneybatter East, as I’m sure it would be known. Rents in Dublin 7 have risen by over 94% from their lowest point. So how could cost-rental help? The idea behind cost rental is that the rent paid by the tenant relates to the cost of making their home, not its market value. This is a crucial distinction. Social housing supports that are based on market values, such as market rents, merely pit the so-called “working tenant” against the so-called “welfare tenant”. There is no guarantee that market rents are enough to encourage new supply. Social housing supports that are based on the cost of providing new homes, however, are – by definition – linked to new supply. And thus, if we as a society want to guarantee a right to a home for all our residents, then cost-rental is a key ingredient. Social housing must be in addition to market housing, not a chunk taken out of it. There is likely to be a significant positive spill-over from such a system. In particular, once they are meaningfully involved in the provision of new homes, local authorities are much more likely to be cost-conscious. A raft of new regulations pertaining to newly built homes were introduced in the aftermath of the Celtic Tiger. They are most commonly justified with reference to what was built during the Celtic Tiger. However, if the regulations that had been in place had been actively enforced, the various shoddy developments that spring to mind would never have occurred. The answer to poorly enforced regulation is not to bring in lots more – it is to enforce what is there in the first place. The net result is that cost-rental would be very expensive if introduced tomorrow. The likely break-even rent for a two-bedroom apartment in the market today is at least €350,000, or €1,800 per month given the yield needed by the ultimate owner. Setting profits and the cost of land to zero, it is still in the region of €1,250. Scrapping local authority levies and VAT also, and taking advantage of low interest rates available to the State, the up-front cost is still in excess of €175,000. These rents are simply not affordable to those in need of social housing. But that huge gap in itself may make local authorities and national policymakers finally pay attention to what housing market commentators such as me have been saying for close to five years now: lowering costs, not increasing rents, is the best way to solve the lack of housing supply. Suppose policymakers do finally grasp the nettle and bring housing costs down by, say, one quarter. The break-even or ‘cost rent’ for a two-bed is still likely to be in the region of €1,000 per month. For many – indeed perhaps most in need of social housing – this will still not be affordable. This is where the second key element of social housing kicks in. Cost rental is just one part of the solution – the other is an income-varying subsidy. Typically, this works by taking a fraction of the disposable income of the tenants, usually about one third. So a household with a monthly disposable income of €1,800 would pay €600 to their housing body for rent. If the cost-rent is €1,000, this means that the taxpayer covers the remaining €400. If the household’s income increased to €2,100, their contribution to the rent would increase to €700 and the subsidy falls to €300. There are many attractive features to such a system. It means that those in most need – for example those with disposable income close to zero – get the most help. It means that there is no disincentive to getting a job, overtime or a promotion. If, in the example above, the tenants’ income went above €3,000 a month, they would simply pay their cost rent of €1,000, with no help from the taxpayer. And social housing, by being based on cost rents, not market rents, means it is no longer the afterthought in the housing sector. In fact, if done through non-profit housing bodies, rather than local authorities, social housing can be first on the page, rather than last. This would be where non-profit housing bodies partner with for-profit developers, to bring a mix of social and market housing to a site. And all the while, the local authority can retain ownership (and ground rents) on the site. But first and foremost, such as system would focus those same local authorities on costs, the root problem of Ireland’s housing crisis. This week, one of the co-founders of Twitter – Biz Stone – was in Dublin and, while here, helped launch an online mapping tool called Reusing Dublin. The tool is a collaboration between Space Engagers, a social enterprise, and the Peter McVerry Trust, one of the country’s leading housing non-profits. The tool is online, at reusingdublin.ie, and is pretty straightforward in its design: if you know of a derelict or vacant home, you can go on to the site and post it. I’m lucky enough to be able to walk into work most days and it’s amazing how many empty homes – or flats above shops – there are once you take the time to look. If successful, it will identify thousands of empty homes around the city, as well as sites that could be used. This in turn will help the city tackle what is a persistent issue, not just in Dublin but in Ireland’s other cities: high vacancy rates. Seven or eight years ago, if you asked someone on the street to picture vacant homes in Ireland, they would probably describe a ghost estate. But ghost estates have by-and-large faded from relevance. Figures out this week show that the number of ghost estates in the country is down over 90% since 2010. There are now 256 ghost estates nationwide and the majority of those are at least partially occupied. Indeed, of the 180,000 units in ghost estates back in 2010, the vast majority were either homes that had not even been started or else homes that were already occupied. There are, in total, just 678 homes in the country that are in ghost estate, complete but sitting empty. That is about five days worth of housing demand. But the paradox, though, is that despite the ghost estate issuing largely being resolved, vacancy is still a huge issue in a country with a housing shortage. In the 2016 Census, 13% of homes were vacant. If they are not in ghost estates, though, what are they? The answer is that Ireland’s vacant homes fall roughly into three categories. Two of those categories are rural. In rural Ireland, there are one-off homes built during the Celtic Tiger – often adjacent to another dwelling – that are empty. And there are also the older rural cottages, many of which have sadly passed their sell-by date. Ireland’s rural population is shrinking – and will continue to do so over coming decades. Those that remain in rural locations are likely to want a payoff, in terms of living space, for being far away from most amenities. The final category are Ireland’s empty urban homes. And here is where things get weird. Strictly speaking, we know almost nothing about, for example, Dublin’s empty homes. What we do know is that the vacancy rate is higher in Dublin City Council than in the other local authorities. This suggests that the problem is related to older urban homes. What is particularly frustrating is that Dublin – and indeed all Irish towns and cities – lack the basic information needed to manage their housing stock effectively. Across Europe, municipalities and city councils have complete registers of who owns what and who lives where. Irish cities have neither. There is a Land Registry, in other words a register of who owns what, but it is incomplete, especially in the cities, where an older system, the Registry of Deeds, was used until recently. The Registry of Deeds is not map-based so finding out who owns what is a very complicated affair. Not only that, while the Land Registry is now compulsory for transactions, this compounds the problem. If ownership is unclear or unknown, a dwelling or a site will never be transacted and thus never go on the Land Registry. And Irish local authorities do not know who lives where. I remember distinctly, while an undergrad on Erasmus, being required to register with the Aliens Office in Cologne. I remember it so clearly because I took offence at the name! But whatever you call it, it makes sense for a city to know who many residents it has and where they live. Of course, the principal reason cities around the world keep track of who owns what and who lives where is that they levy a property tax and thus want to make sure that everyone pays. Indeed, a reasonable number of homes are foreclosed each year in the US not by banks but by the city, for unpaid property taxes. Our local authorities don’t have a property tax, at least not one on the same scale as the rest of the developed world. Therefore, if you don’t have the stick, you need to use the carrot. The ‘Reusing Dublin’ app is one such carrot, because it highlights the opportunities being wasted in front of our eyes. Let’s all look around and take a note of empty or derelict sites and homes. This will at least give information to policymakers that their peers in other countries take for granted. The week just gone has given Ireland its biggest snowfall over 35 years. The snow affected Ireland’s cities and towns as well as its fields and mountains and areas that have perhaps become a little bit inured to hearing about yellow and orange warnings got a reminder that we need to take our experts seriously. This year, the Government is launching its “Ireland 2040” strategy. This comprises two elements. The first is a planning framework out to 2040, setting out the contours of population growth over the next two decades. The second is an investment plan for the next few years, in particular around transportation infrastructure. Does the snowstorm and how it affected daily life here tell our policymakers something important for those plans? This can be thought about in terms of both causes and effects. There will perhaps be some discussion in the aftermath about the causes of events like this. Expect a row about whether events like this will become more common due to climate change, for example. One thing that is certainly relevant, however, is that the Gulf Stream is our protector. Ireland lies between 52 and 55 degrees north of the equator, in line with parts of Alaska and Siberia. To our east, the city of Omsk in Central Russia, which is 55 degrees north, has 144 snowy days a year. Vancouver, on the west coast of Canada and only 49 degrees north, gets roughly 40cm of snow a year. Dublin, on the other hand, has only a handful of snow days a year on average. Ireland is a something of a weather freak. But this all depends on warm air blowing from the southeast. If that were to change, whether because of human activity or some other reason, we would need to be able to deal with more extreme weather – in particular colder winters – a lot more. But the effects of the “Big Snow of 2018” are also relevant. As we take stock of the disruption caused by the snow, an obvious theme emerges. Where people have clustered together, the disruption was far less. Even on Friday morning, at the height of the snowstorm, life in Dublin went on despite the huge snow fall. In the centre of the city, coffee shops served people on their way to work. The regular traffic – mostly pedestrian but some vehicular – meant that the main thoroughfares were navigable, if very snowy. An hour outside the city, however, and life had come to a complete standstill. During the night, numerous vehicles got stuck on the country’s main roads. This includes ambulances, with one seeing a baby born on the side of the road near Kilkenny. In other words, the snow caused the most disruption where we have set up our lives in a way that makes us dependent on travel. The implications for housing are obvious. As Ed Glaeser, the world’s leading urban economist, has written, the research on density is clear. Cities make us not only richer – we can find jobs that match our skills better – they also make us happier and healthier. Services – including healthcare and education but also experiences like restaurants and sports event – are cheaper. As a country, we have been living something of a lie the last thirty years. We have tried to convince ourselves we can have all the benefits of a modern – city-based – economy with actually have the density that cities require. We have spread out, rather than moved closer. And this is getting worse, not better. The number of people commuting more than an hour each way grew by a third between 2011 and 2016 alone. A quarter of the working population of Leinster outside of Dublin now commutes to Dublin every day. And the picture is similar in Cork and Galway. The lie we have been living as a country is that we can live where our parents did but enjoy a standard of living like we see on TV. One-off housing should not be banned – but the full cost of connecting the various utilities and services should be paid by those in one-off housing. Otherwise, we are punishing those who choose to live in the cities. By 2040, based on our what our peers have done, Ireland will probably be a country that is 75% or perhaps 80% urban. This week’s snow confirms just how important it is for policy to facilitate that. Sprawl is certainly an option – but a very costly one. This week, your correspondent is writing to you from Chisinau, the capital of Moldova. Moldova is not like Ireland in many ways. True, it is a small country – a population of roughly 3.5m people. And true, like Dublin, its capital and largest city makes up about one third of the country in terms of people and economic activity. But in almost all other respects, Moldova and Ireland have little in common. Ireland is an island, Moldova is landlocked. Ireland is in the north-west corner of Europe, Moldova in the south-east. We have our own tongue, that we by-and-large ignore. They are happily bilingual, speaking both Romanian and Russian: their trick was to simply call Romanian “Moldovan”. While Ireland is one of Europe’s richest countries, in terms of living standards, Moldova is one of Europe’s poorest. Related to this, while Ireland has one of Europe’s fastest growing populations, Moldova has one of its fastest shrinking ones. Ireland enjoys both a natural increase in its population each year and, once again, net immigration. In Moldova, more people die each year than are born – and it exports its people. Moldova is, in short, the opposite of Ireland. And yet, its very difference to Ireland makes it rich in lessons. For a start, it shows us that there is no inevitability to success. For most of the first 75 years of the Irish state, the question was often asked – sometimes louder and sometimes more quietly – whether independence was a failed experiment. That was in large part because Ireland was both shrinking in population and steadfastly refusing to converge in living standards. That changed in the 1990s when a combination of external factors – in particular the dawn of the European Single Market – gave Ireland a new purpose. From now on, it could act as a springboard for non-EU firms, especially American ones, to access the world’s largest consumer market. Fans of alternate history fictions could write, no doubt, an opposite tale. Suppose the USSR had won the Cold War. In such a version of the world, it is easy to see how Ireland would languish economically on the far reaches of the economic centre of gravity – while Moldova became a bridge between East and West. What’s all this got to do with housing, you might wonder. Last week, the government announced its “Ireland 2040” plan, which includes both a planning framework and a schedule of public investments. So much of the debate since has been about whether Dublin is too big and whether there is enough in the plan for County X or County Y. Too often, it seems our politicians – and perhaps also our voters – have a zero-sum view of the world: if Dublin gains, it must be at the cost of Cork or Longford or Donegal. However, this is sustained by feeling, not science. Economic geography is clear on this point: if you want Cork or Longford or Donegal to be larger, you need Dublin to be larger. It is true that large cities are taking a bigger share of population growth. But this is true across the world and it is naïve to think Ireland can be different – while someone expecting living standards to rise inexorably. The reason large cities are growing faster than smaller ones is because for people to find the right job, now that most have a degree, they need a thick labour market. The same is true for the cost of utilities, like broadband and electricity, and for vital and more discretionary services, like education, healthcare, restaurants and sports events. It’s all very well to say that we need to stop Dublin’s growth, but who do we turn away? More importantly, if we limit Dublin’s growth, or the growth of our other major cities, there is less surplus to be shared around the rest of the country. It is an uncomfortable truth that the Cork and Dublin economies subsidise the rest of the country. If allowed to growth, this gives more for the rest of the country. The pull of the city is, to a skilled workforce, close to irresistible. The strong push factor away from cities at the moment – in Ireland and across the developed world – is the high cost of housing. This is currently happening in the housing market, only, though, and not in the labour market. The result is long commutes, with time and environmental costs. It is important to remember that the premium for living in Dublin is a new phenomenon. It did not exist 30 years ago. Even just five or ten years ago, the gap between the average property price in Dublin and one in Munster (outside its three cities) was just 50%. Now it is close to 100%. Unlike Moldova, Ireland has a business model and one that has worked extraordinarily well for us over the last generation. But a lack of housing where it’s needed is threatening that business model. Bringing down the high cost of housing is simple: enable more homes to be built and built in urban centres where they are needed. Another year of double-digit rent increases – that is the summary of 2017 in a few words. The figures in the latest Daft.ie Rental report show that, on average, listed rents increased by 10.4% during 2017. This compares with an increase of 13.5% in 2016, 9% in 2015 and 10.7% in 2014. In Dublin, the streak is longer: rents have increased by 10% or more every year since 2013 – with the exception of 2015, when rents increased by 8.2%. This means that rents in the capital have increased by an average of 81% from their lowest point. That low was in late 2010, meaning that Dublin rents have risen, in year-on-year terms, for 26 consecutive quarters. This is twice as long as the previous market upswing, which lasted from early 2005 to mid-2008. It’s also twice as long as the downturn, which lasted the following four years. The focus on Dublin is sometimes questioned but, at least in the rental market, is merited. Outside Dublin, rents have increased by 52% on average – well below the increase seen in the capital. And this figure itself is dragged up by areas within the functional Dublin economy: Meath and Louth, for example, have seen rents rise by 81% and 78% respectively since bottoming out. Cork, Galway and Limerick have also seen significantly larger rent increases than the ex-Dublin average – with increases of slightly more than 65% in each case. These changes highlight the structural shifts at work in the economy. In particular, Ireland is converging to its economic peers in Europe and elsewhere, shifting away from agriculture (and manufacturing) and into services. A shift into services means a shift into cities and this is what is putting pressure on the housing market, especially in urban areas. When it comes to living in urban or rural areas, Ireland is not different, just late. Currently, two thirds of its population lives in cities – compared to an average among our OECD peers of 80%. But this fraction has been creeping up over the last half-century and, given density is needed to make the services we enjoy viable, this pressure is not going to go away any time soon. In the context of Ireland’s forthcoming National Planning Framework – dubbed “Ireland 2040” – this is central. If Ireland’s population were to grow by 1% a year between now and 2040, roughly the rate it has grown over the last few decades, its population would be 6 million by then. And if 80% of our population live in the cities in 2040, this means they will house 4.8 million people, up from 3.1 million currently. The other 1.2m people in 2040 will live in rural areas. Currently, though, there are 1.7m people living in rural areas. So, our baseline scenario as a country is that, over the coming generation, urban areas will grow by something like 2% a year, while rural areas will see their populations shrink by 1.5% a year. One typical reaction to this is that there must be some way for policymakers to stem the flow into cities. It is not obvious that this is desirable, though: if we want our young citizens to be well educated, then they will need to be able to use those skills – and this means clustering, in other words cities. Perhaps more open to policymakers is the relative importance of Dublin compared to Ireland’s four other cities. Dublin can appear at first glance to be somewhat outsized relative to the country’s other cities – although once you factor in Belfast and Derry, Ireland looks very similar to most other countries in terms of the how the bigger cities compare to the smaller ones. In fact, somewhat paradoxically, the best hope for rural Ireland lies in the success of the cities. The bigger Dublin and Ireland’s other cities grow, the bigger the population that can be sustained in rural areas. Or to put it another way, if rural Ireland appears consigned to 20% of the total, then it is in the interest of rural Ireland for the total to be as large as possible. In the scenario for 2040 above, an average growth rate of 1% in the population was assumed. This led to a fall in the total rural population of almost half a million (or 30%). If Ireland were able to grow its population by 2% a year – an admittedly very tall order – this would mean its population in 2040 would be close to 7.5 million. In that case, a 20% rural share would mean a fall of just 200,000 in the numbers living in rural areas. However, if Ireland were to grow by just 0.5% a year over the coming generation, the rural shrinkage would be even faster. This slower growth rate – more in line with how fast other high-income countries are growing – would mean a population of just 5.4 million in 2040. In this case, rural Ireland would shrink by 600,000 people in the same time. There is one other way: sprawl. This is the model we have effectively adopted over the last twenty years. Even as our labour market concentrates, we spread our housing further and further out around the country. In principle, we could continue to do this over coming decades. But this kind of development comes with costs, in terms of time, family life and the environment, that hopefully we can agree is not an option. Are we at risk of a demand ‘arms race’? In recent weeks, there has been something of a push-back against the notion that true demand is a multiple of the number of homes being built each year. John McCartney from Savills referred to this as a demand ‘arms race’, with people vying to come up with ever-bigger estimates of the number of new homes needed. More prominently, Conor Skehan, the embattled Chair of the Housing Agency, has gone further. Recently, he accused those who don’t agree with his own estimate of less than 25,000 new homes needed per year as having ulterior motives and putting the country at risk of another property bubble. Some of this stems from not understanding what a bubble is. Ireland’s housing bubble was a credit-fuelled splurge of home-buying. There was a closely connected splurge in home-building, but to the extent that this led to homes built in areas without long-term demand, that was largely a product of extraordinary policy failures, in particular around tax breaks which made building in low-demand areas a free gamble. In order to avoid a repeat of the 1995-2012 bubble and crash, the single most important ingredient the country needs is sensible mortgage rules. And, since the Central Bank intervened in early 2015, by and large it has these. What the market is witnessing now – with increases in sale and rental prices of more than 75% in some parts of Dublin – should surely be evidence enough that demand falls well short of supply. So the solution is more supply. The question is just how much. There are four sources of demand. Most commentators start – and some finish – by just looking at the natural increase in the population. This is the amount by which births exceed deaths. Over the last 15 years, this has been an average of 40,000 but it is fair to say that this has been falling recently. In 2017, the estimated natural increase was just over 33,000 and it is not unreasonable to think that the natural increase will fall below 30,000, perhaps to 25,000, in the next few years. But this does not mean to say that the country needs 33,000 or indeed 25,000 homes each year. These raw numbers have to be converted into households. Based on trends across the developed world, it is prudent to divide the natural increase by 2, and not a larger number, to reflect the fact that average household size is declining. This means that natural increase will add something like 15,000 households a year into the medium-term. That, of course, is something of a crude approximation of how new households are formed. Infant children do not require a home of their own. It is more appropriate to look at the average annual gap between 25-34 year-old women and their 75-84 year-old counterparts. This ‘generational surplus’ has been on average 22,000 a year since 1990 – and indeed was at that level in 2017. Like the natural increase, it has been falling, but again, it would be prudent to plan on needing at least 15,000 and probably closer to 20,000 homes a year. In addition to the natural increase, though, there is also net migration. While this was negative from 2010 to 2014, it is now strongly positive, with 20,000 people moving here – net – in 2017. This is in line with the post-2000 average, and – dividing it by two, to reflect household size – adds another 10,000 to housing demand every year. So far, so good. We have a total of between 25,000 and 30,000 new homes needed per year, based on the fact that Ireland’s population is growing. Job done? It turns out that this is only half the way there. In addition to natural increase and net migration, there is also changing household size and obsolescence. Each year, in every economy in the world, a small fraction of homes fall out of use and into disrepair. The fraction is typically estimated at between half a percent and 0.8%. In Ireland, that means we need between 10,000 and 16,000 homes a year just to offset homes falling out of use. This is the true starting point of housing demand – and applies even in countries with declining populations. On top of that, though, there is the elephant in the house, so to speak: household size. Ireland has seen its average household size fall from 4 people in the 1960s to 2.75 people today. In this, it is undergoing the same transition that all other high-income countries have done before us. As we as a country converge to an average household size of 2.2, or close thereto, this will create huge additional demand – and for smaller homes. Whereas a country of 4 million people, split into households of four people, needs one million homes – the vast majority of them houses, the same country split into households of two persons needs twice as many homes – the vast of them apartments. This is the journey that Ireland is on. To facilitate Ireland converging with its peers, the country needs a further 10,000 homes a year – almost entirely urban apartments. These two latter parts – obsolescence and demographics – and the ones left out by some commentators. Adding them in, it is hard to see how the country needs less than 45,000 homes a year. We need to stop arguing about whether the demand is there and start focusing on supply. Earlier this week, the Government announced a new home loan scheme. The new scheme, which will be effective from the start of February, is targeted at those who earn no more than €75,000 as a couple – or €50,000 as a single earner. In particular, those wishing to avail of the scheme have to provide proof not only of continuous employment over the past two years but also that other mortgage lenders refused to fund them or at least fund them adequately enough to purchase the home. Perhaps the most attractive part of the scheme is the interest rate: if you choose to fix for the full term, the interest rate is just 2% over 25 years or 2.25% over 30 years. On the one hand, this is nothing new. Dublin City Council, for example, already offer almost the exact same deal. It seems, though, that very few people knew about it. This may extend to banks, who may view those interest rates as something of a shock. For someone borrowing at an LTV of more than 80% as a first-time buyer from one of the mainstream mortgage providers, variable interest rates currently range from 3.15% at AIB to 4.5% at Bank of Ireland. So the government has effectively shaken up the mortgage market in two ways. The first is that, by dramatically lowering the price of credit, they have introduced an incentive for people to get turned down by a bank when applying for a mortgage. If you’re borrowing €250,000 for a property worth €275,000, would you rather a monthly mortgage repayment of €1,582 (at 4.5%) or €955 at 2.25%? This is likely to have a few positive spin-offs from a government point of view. The first reason is that it is likely to bring out of the woodwork mortgage applications from people who believe that they would be refused but who, it subsequently turns out, the banks will lend to. The second reason is that this is likely to encourage further interest rate cuts by the banks. It is hard to justify charging twice what the government is for the same product. The single biggest positive side-effect of this move, though, is that it brings term-length fixed rate mortgages to the mass market. Almost no other country in the world relies on the variable rate mortgage to the extent that Ireland does. Unsurprisingly, we are the ones out of step – not the rest of the world. Indeed, in the US, ‘adjustable rate mortgages’ (as they are known there) are viewed with the same disgust as mortgage-backed securities, collateralized debt obligations and all the other financial chicanery produced in the run-up to the Great Recession a decade ago. What financial system would leave vulnerable households exposed to the vagaries of the market for decades on end? My hope is that, by bringing a scheme that already existed at the local authority level to everyone’s attention, it shakes up the mortgage market enough to bring down interest rates and make term-length fixed-rate available more broadly. There are a couple of caveats to what sounds above like good news, however. The first is capacity. The government has only set aside €200 million for this so, if the average mortgage is €200,000, there will only be 1,000 households that will benefit this year. The second is funding: one presumes that this is being funded by the State itself borrowing – and not setting aside current tax revenues. If the Government is borrowing to fund this, it is effectively using its power in the capital markets to pass on low interest rates to individual households. As long as capital markets are hungry for Irish debt, this is a cheap substitute for a tax cut. If however, this is from tax revenues set aside, then the opportunity cost is potentially substantial – not least if those whose incomes is just above the cut-off see themselves pipped in the housing market by those with Government help. And it is this last element – the boost to demand – that is most concerning. For over three years now, the consensus is that Ireland’s housing market is suffering from an acute shortage of supply – especially in Dublin and especially in the rental sector. Making credit more readily available is the single most effective way of boosting demand, not supply. I understand the political need to be seen to be doing something but this does nothing to address supply shortages. Here’s hoping future months see more focus on boosting housing supply, not demand. Should we ban house-building inside the M50? The housing woes of Ireland – and Dublin in particular – at this stage well document and largely well understood. There are few who think we are fighting the last war. As the ESRI said last week, the housing market not undergoing the kind of credit-fuelled bubble that afflicted it in the early 2000s. Nonetheless, just because it is not a credit bubble doesn’t mean that it’s a healthy housing market. Far from it. New CSO figures out this week confirm that the stock of dwellings, measured in euro terms, had been largely stagnant the past decade. While this may have made sense for the period 2007-2012 – when the country as a whole had too much, rather than too little housing – the lack of new housing supply over the last five years has cost the country. This cost has a number of elements. Probably the most visible cost to society is rising homelessness – especially of lower-income families. Another long-term cost is the impact the lack of housing is having on competitiveness, especially in Dublin. The American Chamber of Commerce recently published a report, which I was involved in, highlighting the challenges faced by their members as they seek to expand and create new jobs in the city. But I was involved in another report – for Activate Capital, a financer of developers joint-funded by the taxpayer through ISIF. This report found that the bulk of Ireland’s housing need is not actually for the type of housing we are used to seeing built. There are significantly more family homes in Ireland than there are families: almost 25% too many, when you compare the 700,000 families in Ireland with the 900,000 dwellings to fit families. This is not even a problem in the greater Dublin area, where there is a 10% surplus. Instead, the country’s housing shortage is entirely driven by apartments, or homes for 1-2 persons, and not by 3-4 bedroom houses. The term ‘apartment’ is a bit narrow. Ireland’s roughly 500,000 missing apartments does include medium-to-high rise apartments in urban cores for young professionals – and low-to-medium rise suburban apartments for empty-nesters. But Ireland’s missing homes also includes tens of thousands of units in purpose-built student accommodation and co-living developments for key workers and young professionals. It also includes a similar number of missing homes in our largely non-existent independent living and assisted living segments for the country’s older residents. These half a million missing homes represent a backlog – but it is not even a simple matter of meeting the backlog and then returning to ‘business as usual’ and building lots of family houses. When it comes to Ireland’s demographics, the outlook for the rest of the twenty-first century will be driven by three main forces: population growth, urbanisation and falling household size. Unlike any other European country, Ireland will experience faster population growth in the 21st century than in either the 19th or 20th. For the century and a half to 1990, Ireland typically lost 5% of its population each decade. During the 21st century, the country will gain 5%. Every other European country is experiencing a slowdown. You could argue that, since the Famine, the country has been a late bloomer, not only in terms of living standards but also population densities. This argument holds true for urbanization also. Ireland is now roughly as urban as the typical Western European country was 50 years ago. Over the next half-century, the country will go from 65% urban to 80% or more urban. And lastly, there is household size. Once again, we are behind the curve. All European countries are on a journey from 4 persons or more in the typical household to just 2, or maybe slightly above. Ireland remains well above our peers, with 2.8 persons currently in the typical household. But this number has been falling steadily in Ireland since the 1960s. And it will continue to fall over coming decades. Add these three factors together, and by 2080, you have a population of perhaps 6.3 million people living in Ireland, 80% or more of whom living in the cities and with the vast majority of households comprising just one or two persons. This is not a recipe for strong demand for housing estates even further out from our urban cores. This is a recipe for building hundreds of apartments – of whatever type – in Dublin and throughout the country, every month for decades. Just taking Dublin alone, the city will in rough terms 2,500 apartment blocks with an average of 200 apartments built over the next half-century. With a need for apartments this size, it certainly seems perverse of local authorities to favour commercial – especially office space – over residential. And it also seems perverse to allow development of estates of family houses when the city has an abundance of them already and when there is such a scarcity of apartments. Given this stark background, it would seem prudent for Dublin’s four local authorities come together and agree both on a long-term multi-decade goal for housing in the city. It also seems wise that residential development, where it happens in the city, should be primarily – almost exclusively – in the form of apartments, not houses. The Daft.ie Rental Report out earlier this week found that rents are still rising at double-digit rates around the country. Both nationally and in Dublin, this is the sixth quarter in a row that rents have been at least 10% higher than a year previously. Outside Dublin, rents are now roughly one half higher than their lowest point, which was in early 2012. In Dublin, the increase has been even greater – rents have risen by three quarters from their lowest point in late 2010. While South County Dublin, and Dublin 14 and 16, have seen rent increases of about two thirds, in Dublin 8, rents have increase by more than 90% from their lowest point. It is likely that within the next six months, one of the Dublin postcode – possible Dublin 1, 7 or 8 – will have seen rents double within eight years. A natural reaction for many to this is to demand limits on rent increases. This is akin to a Minster for Health banning people from having high temperatures. High rents, like high temperatures, are not the problem – they are the symptom of the problem. Fair enough, you might think, but I’ll still take a paracetamol when the need arises, thank you very much. And if that’s all that controls on rent increases did, then there would little to worry about. The problem is that controls on rent increases turn the market into a system with insiders pitted against outsiders. Those who have a lease keep it. Those who have to move, either into the city or to somewhere new because circumstances change, lose out. To extend the paracetamol analogy, would you take one if it meant that your headache would go off and afflict someone poorer than you instead? To solve the underlying problem, rather than just the symptom, the whole country – but Dublin in particular – needs significantly more supply of rental homes. 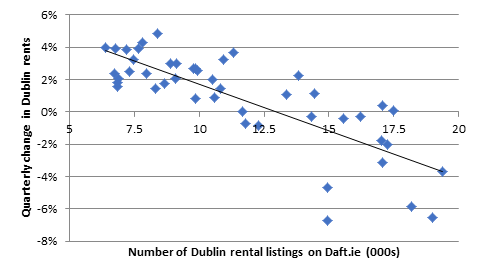 The last time rents rose rapidly, in 2006 and early 2007, there were an average of 10,000 rental homes in Dublin posted on daft.ie each quarter. Over the following five years, there were a variety of different totals posted each quarter and taking the picture as a whole, it reveals that, when roughly 14,000 Dublin homes were listed in a three-month period, rents were stable. More than 14,000 meant that rents fell (2008-2010 in particular), while less than that total meant rents rose. In late 2012, the total number of listings in a three-month period fell below 14,000 and it has continued to fall since. Since the start of 2014, there has been an average of just 7,500 Dublin homes posted for rent every three months. It is therefore completely unsurprising that rents have risen consistently over that period. Given that the rental sector in Dublin is roughly 50% larger now than a decade ago, it is realistic to think that rents will not start to fall until the number of listings in the capital exceeds 15,000 in a three-month period. But where will these extra 2,500 rental homes every month come from? They won’t come from the stock of owner-occupied homes – those are also in short enough supply. There are some quick wins dotted around the capital in the form of vacant homes and there is also potential for over-the-shop conversions. But in each case, this will take time and the potential should not be overstated. Even the most optimistic estimates of over-the-shop space puts the total number of new homes at perhaps 5,000 or 6,000 – roughly two months supply. Similarly, even a halving of the vacancy rate in County Dublin would only bring a few months on to the market. Obviously, either or both of these would certainly be welcome. But there are reasons that these haven’t happened already, despite an almost-doubling of rents in the capital. The poor utilization of our built stock stems from a heady cocktail that includes – but is not limited to – low property taxes, incomplete registry of title, conflicting regulations and weak local authorities. Tackling any one of those issues would take years, let alone all. Thus, while local authorities and the national policymakers should not ignore vacancy, the real solution lies in building new homes. With an average lease length of roughly 3 years, this means that the city needs about 800 homes a month – or an apartment block of 200 homes opening every week. With only a tiny fraction of that currently being built, the challenge for policymakers is to transform the city’s construction sector into one of the best in the world at building apartments. Is David McWilliams right – are we in another housing bubble? The current state of Ireland’s housing system is well known: plagued by a chronic and growing shortage, especially in Dublin, both sale and rental prices increase quarter on quarter. Since the third quarter of 2012, sale prices in the capital have increased in all but three quarters. In the rental market, they have increased in every single quarter. The fact that both sale and rental prices have now been rising longer than they were falling has led some to argue that we are in another housing bubble. Among the most prominent of those arguing another bubble is coming is David McWilliams. On the face of it, one would have to be brave to bet against him. David argued a housing bubble was coming down the tracks as early as the late 1990s. Some write this off as “a stopped clock is right twice a day”. However, watching on YouTube his debate with Austin Hughes in October 2003, it is not the prediction of a crash that is arresting, rather how eerily accurate the mechanisms and fallout. A couple of weeks ago, David argued that he believes there is another bubble building ‘very rapidly’ and that a crash will happen in ‘the coming years’. Outlining his case, he made two main points. The first is that you don’t need credit to have a housing bubble. The second concerns the price of a home relative to incomes. David, and others, believe that is simply not sustainable for three-bed semis in Dublin to cost €450,000 when an average wage is one tenth of this. There are two minor quibbles with this latter point. The first is that almost nobody buys a property on their own anymore. The average new mortgage has gone from having 1.3 incomes in the 1990s to 1.7 incomes now. So the proper income in David’s example would be the average household income of roughly €75,000, not a single earner. Also, while appealing, the average property price is not the correct one to use in this case. First-time buyers don’t buy the average property. They typically buy newly built homes at the edge of the city, in other words far cheaper than the overall average. So instead of €450,000 to €45,000, the real comparison is probably more likely €325,000 to €75,000. Still, that means that the house price is 4.3 times income, well above the typical level regarded as affordable, which is three times income. But t is important to distinguish between what is healthy and what is sustainable. It is not healthy to have high housing prices in major cities, compared to people’s incomes. But cities around the world have been living with this for close to fifty years in some cases. In Ireland, the ‘Dublin premium’ is just 30 years old. Up until that point, the average price of a home in the capital was the same as the rest of the country. It probably had a bedroom less and a much smaller garden but the price was effectively the same. But this point works both ways. This is a phenomenon that has been building up for 30 years. It stems from restrictions on land use – the hidden costs of planning and zoning – that prevent housing supply from meeting housing demand. Other cities have had similar supply shortages for 50 years, so it is not obvious to me that expensive housing per se is enough to cause a collapse. David’s other point is that you don’t need credit for a housing bubble. This is presumably to pre-empt someone like me arguing that the new Central Bank mortgage rules effectively rule out the type of lending that cause the 2000s bubble and subsequent crash. The godfather of studying bubbles, Charles Kindleberger, argued that a rush of capital (i.e. money) was a necessary ingredient for any bubble. Capital comes in two forms: credit or equity, in other words borrowing to buy or using up savings to buy. There are plenty of examples of bubbles where people have cashed in their savings to buy at unsustainable prices. It is argued that the dot-com bubble is the best recent example of this. What makes David’s argument trickier to carry over to housing is that real estate is typically very highly leverage in the first place; in other words, there’s lots of debt associated with property. A savings-fuelled housing bubble is a much rarer phenomenon. Nonetheless, Australia, New Zealand and Canada have found themselves worrying about this problem as their housing markets bear the brunt of Chinese savers’ desire for external assets. But it’s not just about ownership. The key thing about a bubble is the ratio of sale to rental prices. In markets like Auckland, Sydney and Vancouver, foreign purchasers of property left their dwellings empty, effectively taking them out of the market. But if something should trigger a departure for these buyers, a flood of new homes would come on to the market. Earlier, I mentioned that both sale and rental prices have been increasing. Indeed, since 2012, rental prices have actually increased by more, in percentage terms, than sale prices. Rental prices are up three quarters in Dublin and by half outside Dublin from their lowest point. Sale prices are up by 60% in the capital and 47% elsewhere. The single best barometer of a housing bubble remains the ratio of sale to rental prices in housing. It is generally thought of as safe to pay 20-25 times the annual rent to buy a home. This is the same a home giving you a return of 4% to 5% a year. Those buying four-bedroom homes in West Dublin currently are spending 23 times the rent on average, right in the safe zone. In the Celtic Tiger bubble, people were prepared to pay 40-50 times and in some cases up to 100 times the annual rent. That key difference tells me that we should not be fighting the last war, when it comes to housing. We have a shortage of housing and that gets tackled one way only: more homes.